Sunsets come in all colors. Well, not exactly. I’ve never seen a green sunset, but on a day when the smog was very bad, I saw one that looked greenish-gray. I suspect most of the green was the color of the smog itself. But when you limit yourself to “natural” sunset colors, violet and/or indigo are the most uncommon. The reason for this is the way our atmosphere refracts and scatters light. For a quick review on scattering see my column on Why Most Sunsets are Red. Refraction is the bending of light rays as they move from one medium (outer space) into another (Earth’s atmosphere). It’s the same thing a prism does to light. The individual colors are dispersed, with violet changing direction the most, and red the least. 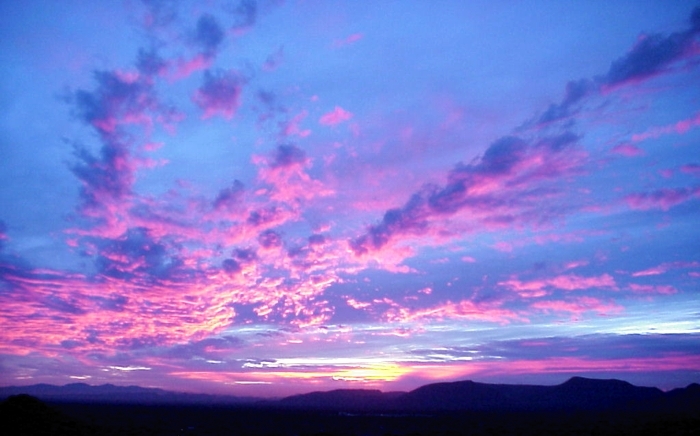 This photo was taken about 30-45 minutes after sunset, looking toward the west from Arizona. You can probably tell the Sun is already below the horizon. With this geometry, there’s no direct rays of sunlight reaching your eyes. The reds, oranges, and yellows are now coloring a sunset in California. I saw them 30-45 minutes ago. Those violet and indigo colors are being refracted by the atmosphere over California and sent our way. This requires clear upper air and just the right Sun angle to happen, and it never lasts as long as a red sunset. The undersides of the clouds are reflecting those violet and indigo rays to my camera. The colors disappeared in less than 10 minutes, but a photo lasts forever. You might well ask: Why aren’t there green sunsets? That’s a topic for a future column, where I’ll discuss a very rare phenomenon known as the green flash. If you’re impatient, look here.